The fossil fuel divestment movement has spread like wildfire within campuses and across the country. There are over 100 universities that have active campaigns, even though there were about a dozen just a few months again. At Harvard, we began the semester with the daunting task of launching a new campaign. Through hard work and dedication, we brought climate change and divestment to the forefront of campus dialogue and achieved a resounding vote of support (72%) in our student government election. Now 350.org’s Jamie Henn is using a national platform to call on Harvard’s administration to take a leadership role on this critical issue. This is what First Here, Then Everywhere is all about. Something starts small with a just a few people. Yet passion and dedication cause the issue to spread, inspiring hundreds of others to join your cause. The divestment campaign has the added benefit of being well-coordinated and well-connected. GoFossilFree.org is the central national website. And then there is the Fossil Free Network app on Facebook. 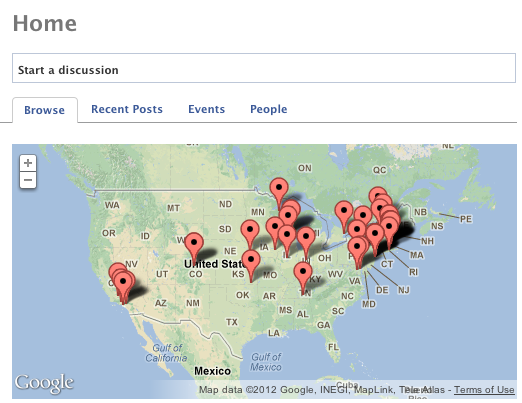 You can connect with other divestment activists in your area, discuss, and share. This is an amazing resource for anyone interested in divestment or already involved!